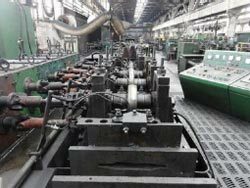 National Machinery Exchange has sold more tube mills and related tube equipment than any other dealer in the world. Whether your needs are for pierced, extruded seamless tube pipe or welded, we're your source!  Complete factory liquidation, Production Lines, Pilger Mills, Assel Mills, Tube and Pipe Stretch Reducers, Hydrostatic Testers.  Longitudinal Welded, Spiral Welded, Stainless Steel, Ferrous or Non-Ferrous, for Small Diameter or Large Diameter, Tube or Pipe. We also stock tube processing equipment including tube straighteners, pointers, swagers, tube end forming, tube threader, spinners, bull blocks, tube finishing lines, pancake coilers, straight and cuts line, expanders, deburring machines, tube coating lines, tube galvanizing line, accumulators, welders for ERW mills, etc. National Machinery Exchange also specializes roll forming line for basic open channel roll forming to specialty lines for bridge decking or stud and track. We specialize in standard roll forming equipment and complete roll forming lines. Contact us with all your tube machinery needs.